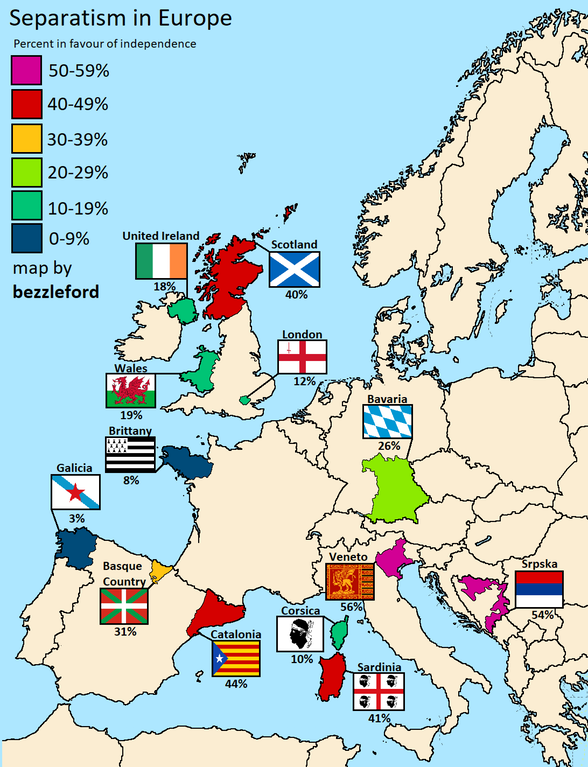 Compiled by redditor bezzleford, this map offers a rough view of support for independence in various European regions. Scotland and Catalonia are well-known hotspots, but I didn't know about Sardinia or Venice. And, of course, there's the good old Serb Republic! with no clear direction as to what the general support for partition or independence were. "But 90%+ of Catalonians just voted for independence?!" - please don't attack me for this as I merely made an average (as stated above) of the three most recent polls which averaged out to 44% in support of independence. "What about an Independent Northern Ireland" - since it was a higher figure, I used support for a United Ireland. But otherwise if anyone is curious support for an independent Northern Ireland is around 5-7%.